Sir Ian McKellen, the stage and screen actor best known for his role as Gandalf in the Lord of the Rings trilogy has been honoured at a ceremony in Londonderry. 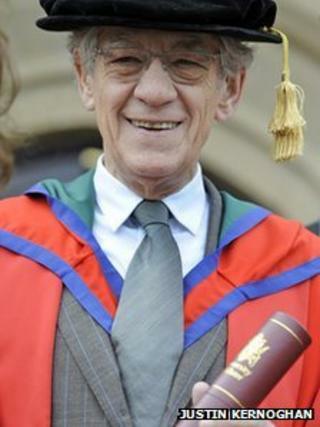 Sir Ian received an honorary doctorate from the University of Ulster at its Magee campus. The doctorate was conferred by the university's chancellor, the actor James Nesbitt. Both men recently starred in The Hobbit film. Sir Ian explained how he came to be at the Magee campus. "We were sitting on a mountain in middle earth about six months ago and he was proudly telling me he was chancellor of a university. "I didn't quite believe him, but he said 'oh come on, you come over and I'll show you', so here I am and delighted to be here for the first time." Sir Ian also delivered the annual chancellor's lecture to an invited audience. His lecture focused on religious and homophobic prejudice and the difficulties faced by homosexuals for many decades. Dr McKellen paid tribute to Stonewall and other gay groups at home and abroad for their work to promote equality. "Thanks to every gay person in public and non-public life who has come out," he said. "Thanks most perhaps to the cherished national belief that an Englishman - and an Irishman's - home is his castle and that the state has no business interfering in their bedrooms. "Every rotten anti-gay law has been repealed, shaken down from the constitutional tree. So complete is the reversal, that we even have the anomaly of civil partnerships which are not available to heterosexuals and uniquely benefit the gays!" Previous figures who have delivered the chancellor's lecture include the jurist Baroness Kennedy, respected journalist and broadcaster Jon Snow, the then Irish President Mary McAleese, the Lord Chief Justice for Northern Ireland Sir Declan Morgan and Taoiseach Enda Kenny. Vice Chancellor Prof Richard Barnett, who delivered a speech to Sir Ian before the presentation of his honorary doctorate, said it was a great coup for the university to be able to salute one of the greatest actors on stage and screen and campaigners for gay equality. "Sir Ian's performances have guaranteed him a place in the canon of English stage and film actors," he said. "But Ian Murray McKellen is also a man of deep personal conscience. He is known as a voice of liberty. "And he is known for his attention to the everyday matters of human courtesy, respect and loyalty - all evident in his acting."